I keep getting this message on one of my accounts: http://jdcdemo.com/security-exception.jpg and do not have a clue what it means and/or what to do about it, if anything. I will appreciate any and all advice. If you are sure you are really connecting to the right POP server you can tell Thunderbird to make a security exception (i.e. ignore the warning). However I suggest you duplicate the error using a browser to log into their webmail (so that you can pushback on an attempt to blame it on Thunderbird) and then call your email provider. Hopefully they will confirm its a known problem that they will fix in a few days. As a website, https connections to www.joedempseyphoto.com work fine. The certificate for the pop3 server is probably misconfigured. It likely points to www.joedempseyphoto or joedempseyphoto, therefore the "belongs to a different site" error. It should point to pop3, or to a wildcard certificate, *.joedempseyphoto.com If you are the only person who needs to access that email server, you can store the wrong certificate permanently and there should be no side effects and the message should not keep occurring. 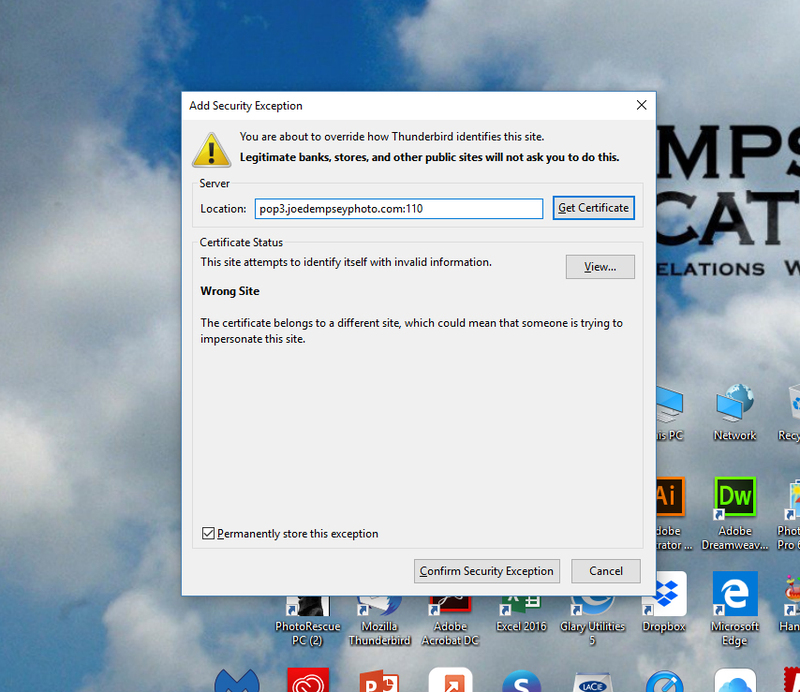 However it may be a sign that your certificates in general are misconfigured. That would mean that any non-https connections could also give errors. So, if you have an ftp site, its ssl certificate may be pointing to www as well, so anyone logging in to it would get an error. You also should send some test emails and verify that they go through are not caught as spam by some popular email services, to make sure there are not other problems with how the mail server is set up. One other possible cause is that your computer system's date/time/timezone settings are incorrect thus making the server's SSL certificate date appear to be invalid.